Best practices are paramount for IT departments, and Track-It! Help Desk is the core product that provides a 360° view of your work orders and change requests. Track-It! Help Desk allows you to evaluate and measure your end-user satisfaction, to improve rates of resolution at lower costs with adherence to your industry. Track-It! Help Desk gives you a hand to automate processes and building your Knowledge Base of solutions, ensuring faster and more accurate answers to your end-user’s requests: By migrating manual processes to the automated Track-It! Help Desk, you will handle your phone calls quickly, and making your data available when needed. In addition to being a solution for creating your Knowledge Base of solutions, Track-It! Help Desk also provides online 24/7 self-service and status checks. This provides you more agile service request management. These features increase your end-user’s confidence when making requests through the helpdesk. To keep up the profitability of your operations, you need to align your IT to your business’ objectives. In this fashion, you will ensure optimum availability, reliability, security and performance of your IT. Track-It! Help Desk aids you to save time and money: It provides an installation wizard that helps you to easily manage the user’s interface. 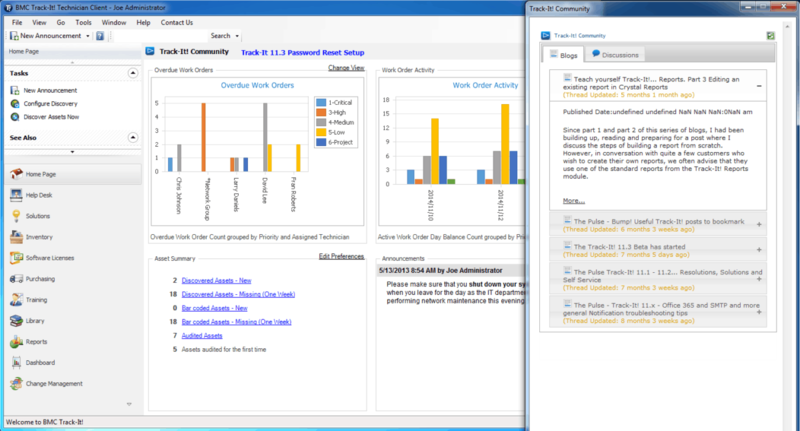 With similar fashion "look and feel" of Microsoft® Outlook, the interface allows to making easier to understand the activities available for end-users. Track-It! Help Desk allows you to automate your Procedures Manuals, your email notifications, SLA notifications, skills-based routing, audit trails and much more. It ensures optimal solutions, and reliable and consistent response times. Track-It! Help Desk Module Solutions assists you to create a Knowledge Base that compiles common problems and solutions, enabling quick troubleshooting available for all your staff members to attend your end-users concerns. Similarly, the Knowledge Base is a great resource that helps you to save time when training new IT staff. Solutions can be classified into different folders to organize related topics. You can also restrict what solutions you will show to your users in the self-service module, as some solutions are strictly intended for the use of IT staff.